The 113th Congress adjourned Friday for its month-long August recess amidst predictions that it will rival the 112th Congress' record as the least productive ever. So far this Congress has sent 22 bills to President Obama for his signature since it convened in January -- compared to the 112th Congress' 28 bills at this point in time. 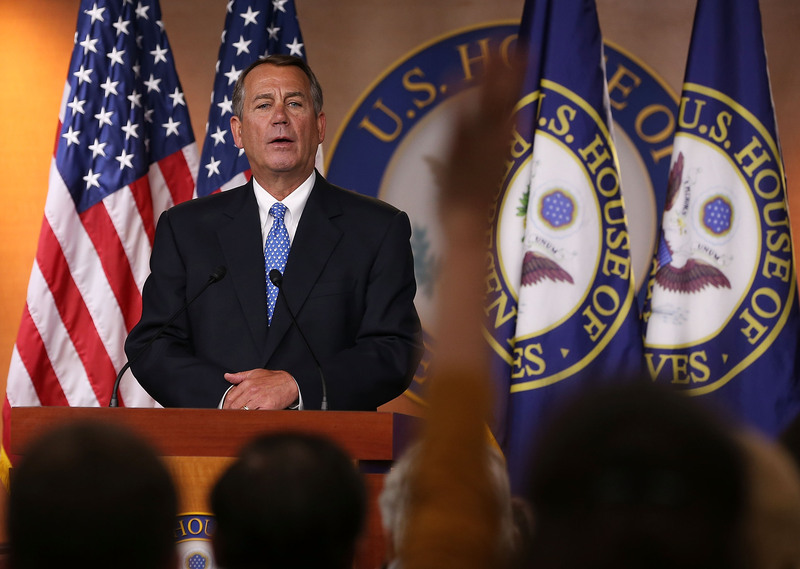 What did House Speaker John Boehner (R-OH) have to say in response to such conjecture? "We should not be judged on how many new laws we create," said the Republican leader. "We ought to be judged on how many laws we repeal." Not exactly the most uplifting take on the role of the legislative branch, but to mark the start of the August recess, let's take a look at what Boehner's chamber has accomplished (or not so much) so far this term. Let's start with Obamacare. The House has voted to repeal Obamacare (wait for it) 40 times. When it could be doing, um, anything else productive, the House voted Friday for the fortieth time to repeal Obamacare right before its recess. In a 232-185 vote, the the Republican-controlled House voted to approve a measure to prevent the IRS from enforcing Obamacare. Just like the first 39 times, the measure is almost certain to die in the Democrat-controlled Senate. Perhaps Boehner meant to say, "We ought to be judged on how many times we attempt to repeal a single law." If so, give the GOP an A+ for determination. The House failed a farm bill in June — but is now planning a new bill that would cut $40 billion of food stamp funding. Government agriculture programs expire September 30, and Congress has so far been unable to pass legislature to instate new ones. Now, House leaders are proposing a new plan to cut $40 billion worth of food stamp funding, doubling cuts previously sought by House Republicans and really not putting forth much effort to compromise with the Democrat-led Senate. The House leaves for recess without holding votes on any legislation regarding immigration reform. The Senate voted 68-32 to pass the bipartisan Gang of Eight immigration reform that would both create a pathway to citizenship for the 11 million undocumented immigrants in the United States and enact the toughest border security in the country's history. The House has yet to touch immigration reform, which seems like something that should be a slightly higher priority than trying to repeal a law that is currently impossible to repeal. This cantaloupe was picked by an immigrant in California. You gave Steve King a vote. Give us a vote for citizenship. “Today is a critical day, it’s the day before they go out on recess, and they need to know that when they get back, we’re going to be pressuring them, and it has to be done, and it has to be done before November,” said Amanda Moreno, one of the activists. The House did pass an abortion bill: the most restrictive considered by Congress in a decade. The House voted 228-196 to pass a highly restrictive abortion bill that would ban abortion past 20 weeks and that has no chance of passing the Senate. In a 221-207 vote, the House passed an education bill that would eliminate more than 70 existing elementary and secondary education programs, replacing them with block grant money that states could use as they see best. "This bill guts funding for public education, abdicates the federal government's responsibility to ensure every child has an equal opportunity to a quality education, and it walks away from our duty to hold school systems accountable," said Rep. George Miller (D-CA), the top Democrat on the education committee. Not good, but then again, it's not going to be law. Showing division within the Republican Party, the House failed to pass a transportation bill. The House called off a vote on a $44 billion transportation bill Wednesday, because it did not have enough Republican votes to pass. Failure to pass the transportation bill signifies a lack of funding consensus in the House, which means that agencies may be forced to continue operating under the forced sequestration cuts that started in March. One of the biggest congressional battles is how the sequester and its automatic budget cuts will play out next year. House Republicans want to set spending at a level of $967 billion, and Senate Democrats are aiming for $1.058 trillion. Right now, the chambers are at an impasse, but thankfully the House finally seems to understand a compromise needs to be made in order to avoid government shutdown. Seven months ago, Republicans had fooled themselves into believing they could get a better deal by doing nothing and letting the sequester take over. Now they realize they need a deal that gets sequestration off the table. ...So, that's the House of Representatives for you. Worried about how you're going to possibly get by for the next month without Congressional proceedings? (As if.) Have no fear, because the House Republican Conference’s 31-page August recess playbook is all about reaching out to women, millennials, and minorities during the time off. Look out for a "Millennial Health Care Forum" coming a to you in order to help "young Americans brace for the implementation of ObamaCare and the ‘rate shock’ that will accompany it.” Because there's no better way to spend the summer.